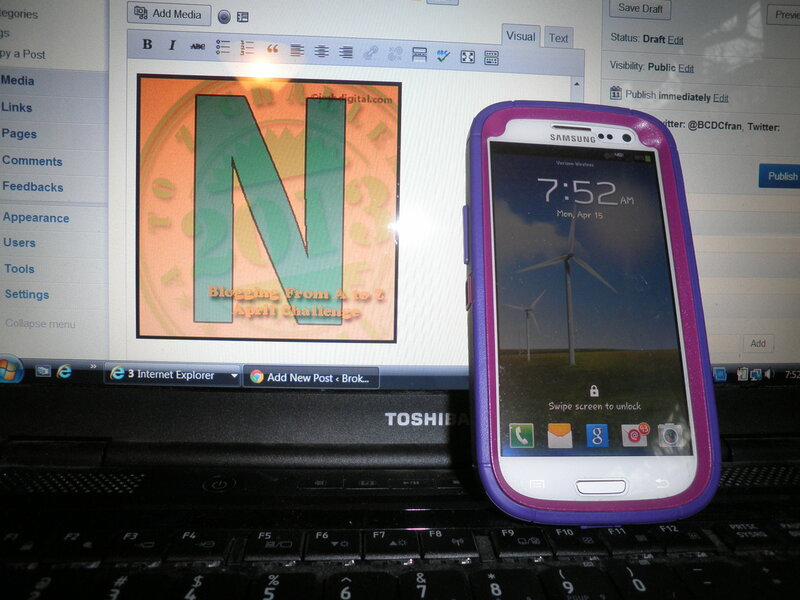 Now we have come to the letter N. Now we come to New. The next step in my journey through the alphabet with you. Very odd that I seem to be rhyming today…give me a moment and I’ll get over it. Today’s star in the Blogging A to Z Challenge is the letter N.
So often on BCDC, I talk about old things, antique things, found objects and treasures bought at thrift stores and yard sales. My life is full of those sorts of things. Once in a while, something new actually comes into my life. Ralph had paid a visit to Radio Shack last week and in talking with a young man there, found out he was due for an upgrade on his phone. He wanted me to come along because he wanted me to talk with the young man because he thought I would understand better what he was talking about. Last Friday we did that. As it turns out I was due for an upgrade as well. I knew that, but I was dragging my feet, not sure what I wanted to do. I don’t like that we spend so much on cell phones and service and I was considering going to a buy as you go plan. But as it turns out the deal was better than we thought. For two new smart phones (which unfortunately don’t come with smart people who know how to use them!!) it is only $10 more per phone per month from what we were already paying. Of course, that doesn’t factor in the cost of the phones, taxes, yada, yada, yada. In my mind however, it is a great step in the right direction because this is encouraging Ralph to get into some technology that in the long run will help him. He is so cute with his new iPhone. Especially now that he realizes that his niece, Marie also has an iPhone and they can do FaceTime together. They’re so cute! He can even send a text! But back to Me!! 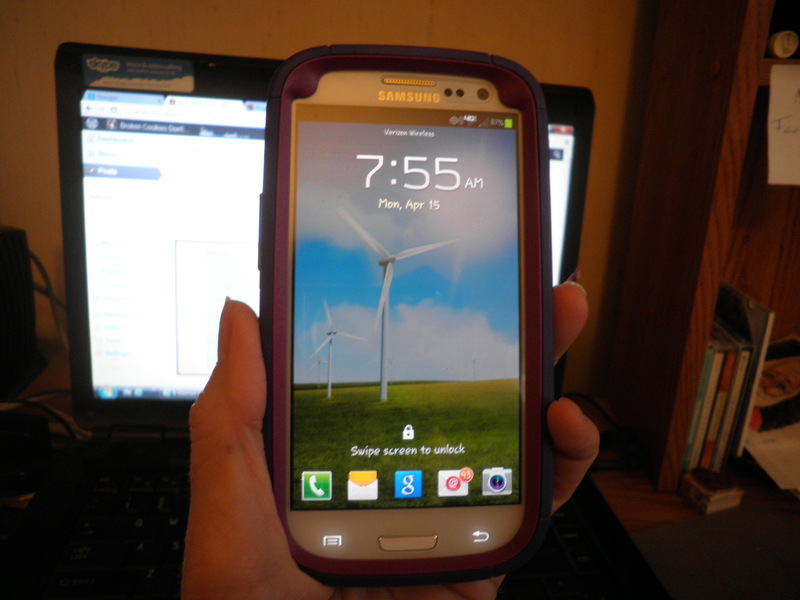 I’ve thought a few times that maybe I should have gone with an iPhone as well, but instead I went with a Samsung Galaxy S III. As it stands, I’m still not sure what all it can do. I’m still not sure when it’s ringing because I’m not used to the ringtones yet. But I can send a text, and answer the phone. Now I have to do some set up things that will allow me to download apps and I need to do that for Ralph as well. Overall, I’m very excited. It has a wonderful purple and pink protective case…Ralph’s case has an American Flag…he’s excited. I’m especially excited because I love the windmill background I was able to get. It makes me think we’re on a cross-country trip. It even changes from day to night. You all just need to be patient with me on this. If you call, give me time to get it out of my pocket (it is pretty big!) and to figure out how to answer you. But, hey…it’s New!!! This entry was posted in Uncategorized and tagged Blogging A to Z. Bookmark the permalink. congrats on the new phone, fran!! manager paul has the same galaxy III and he loves it. that is just great that you and ralph both have new “toys!” i was thinking of upgrading/switching (my bb is 3.5 years old) but have put that idea on hold…i will admit i am fearful of figuring out the new technology/i don’t want to put the time into it! maybe in the fall!?! i am so sad about the explosions at the boston marathon – what a scary, senseless act at such a happy event. Cathy, you were the first person I thought of when I heard about the explosions. So sad and senseless. There was no news the last I heard on who did it. I can’t watch the news for too long, starts to make me crazy. Ralph and I are both having fun with our new toys. It’s a big decision. I was due for an upgrade 2 years ago, but didn’t do anything because I couldn’t decide. Ralph has been telling people he’s finally come into the 20th century. When I said, No dear,it’s the 21st century. He said, yes…and I’ve come into the 20th century. Give me some time. He’s funny. He thanks you for our birthday wishes. We had a lovely day. Take care, Cath! It is the rage that is for sure and given time you will figure it all out:) Happy A-Z challenge. Thanks for visiting, Monica! Each day I learn something new. I’m loading apps now and that’s really helpful. Thanks for stopping by from the A to Z!! So far I’m not a smart phone person. Most of the time I’m with hubby so not sure we both need one; then again I can’t even answer his because I’m so use to my old thing. It seems with all the new things in phones they overlook what a phone is suppose to be. A clear way to hear someone. The oldest phone I had, had wonderful sound and no one had trouble hearing or understanding me, but all the ;people with new phones seem to have issues. Hi Sandy, thanks for visiting!! It definitely is different and over the years, some of my simplest phones had the best sound, you’re right about that. It’s bigger than I’d like it to be, can’t just shove it in my pocket as I could with my last one, but it has a lot of pluses. Please stop by again!